The many causes David G Newman, QC has championed show an understanding of the complex societal issues with which Canada struggles; and reveal a deep and profound compassion for the welfare of others, whoever and wherever they may be. As a young law student at Dalhousie, Class of 1968, David was already displaying the natural leadership that makes his commitment to endeavours so successful. At that time, he and two of his classmates came up with the idea of bringing together three students from every law school in Canada to participate in a meaningful conference in honour of Canada’s 1967 centennial. David served as the executive director of this historic gathering, raising funds and arranging the myriad details required for the conference to be an unqualified success. It was David’s first response to the Weldon tradition of public service. David went on to build a reputation as a lawyer serving as an advocate, dispute resolver and educator in the areas of institutional abuse of power, labour and employment, aboriginal and environmental law. He went on as well to grow in stature as a “servant leader”, using his considerable skills and knowledge to lead other volunteers in service to the community including the Chambers of Commerce and Rotary grass roots movements and professional, church, environmental, sport and fitness and healthy-living organizations. In elected office, as a provincial Cabinet Minister, his thoughtful and thorough approach to addressing issues lifted him above the partisan adversarial nature of the Legislature, earning him the respect of all political parties in the Assembly. His accomplishments and initiatives as Manitoba’s Minister of Northern and Native Affairs, Energy and Mines, Manitoba Hydro and Community Economic Development Fund were notably farsighted, pro-active and effective. But it is his zeal as an advocate for those who are left abandoned in the shadows that is David’s prime motivating force. Whatever endeavour he undertakes, there is a consistent thread woven through the fabric of David’s work. He strives always to achieve justice for the powerless; and to help those who hold power become more sensitive to its impact upon others. “We are all God’s children,” he says, “and we are all interdependent.” His uppermost desire is to bring people together in understanding, but where this is not possible he stands as a fierce and formidable advocate for justice. He has devoted himself to achieving change in the alarming, sometimes horrifying, statistics that reflect the current reality of Canada’s Aboriginal people. In his role as counsel and true friend to individuals and groups from Aboriginal communities, David has been fearless in his support of democracy and human rights on reserves, standing consistently — and often literally — with the disadvantaged. Concerned that Canada’s current Indian Act is apartheid in nature, David seeks diligently for positive change that would give hope to the innocent, the vulnerable, and the powerless. He seeks to provide inspiration for those Indigenous Peoples who know they are trapped in a system that isn’t working, but don’t know how to extricate themselves from their circumstances. David is quick in all things to give credit to others, and expresses great admiration for the courage and heroism shown by so many of his disadvantaged clients. “They” he has said, “are wounded and afraid, operating outside of their familiar zones, but they hang in there and courageously and sacrificially seek justice, dignity and respect. Their positive precedents benefit countless other individuals. They are heroic.” David builds partnerships and trust, working with others to create a better world in which individuals are treated with dignity, respect and, in the purest sense of the word, love. It is his belief that his professional integrity carries with it a responsibility to nurture and serve in this way. 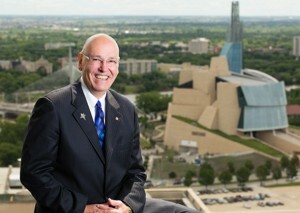 David’s role in the Rotary movement started in 1983 when he became of a member of the Rotary Club of Winnipeg, Paul Harris Fellow in 1992, President 1994-1995, Co-Founder of Rotary Word Peace Partners 2003 and Co-Chair since 2009, Co-Founder and Co-Chair of Peace Days since 2010, Honorary Legal Counsel for District 5550 since 2005 and Co-Chair of Honouring Indigenous Peoples Committee of Rotary Club of Winnipeg since 2015. David continues to serve above self in the Rotary movement with passion to facilitate and inspire others in our global human family to advance understanding, goodwill, peace and compassionate action.